Today was one of those days where it just wasn’t happening. It was hot, sunny and I arrived for our session only a few minutes after the young person had arrived home from an after school sports session. My plan: a bit of assessment, a bit of focused language work. It quickly became clear that this young person was tired, distracted by the heat and not in a place to sit and focus on my plan. I could have ploughed on, eager to ‘get the assessment done’ but that would have been doing this person a total dis-service. So, what to do? We headed out to the park! We took some toys and took our therapy goals out into the real world. We practiced our prepositions by playing hide and seek with the small animals, hiding them in, on, under and beside the play equipment. We practiced our expressive SV structures and -ing endings by sending the giraffe down the slide “the giraffe is sliding” and making the horse dizzy on the spinner “the horse is spinning”. What did I learn today? That it doesn’t always go to plan, that my plan is important but not essential and that by being creative, flexible and just a little bit crazy spontaneous, there are opportunities to embed our learning and hard work over the weeks with something that is child led and super fun! 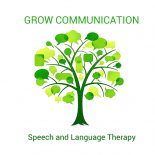 This entry was posted on May 17, 2018 by katygrow in Uncategorized and tagged child, children, communication, FAMILY, play, slpeeps, speech therapy.